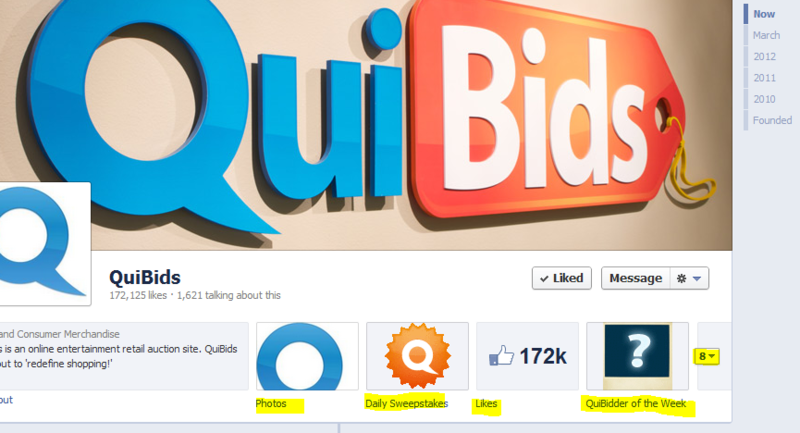 Home / QuiBids’ Facebook Timeline is Live! 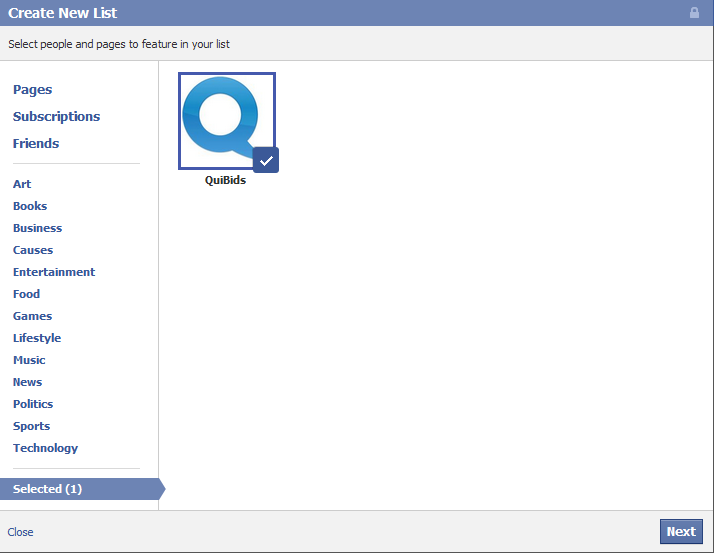 QuiBids’ Facebook Timeline is Live! Corporations are people, too! At least in the sense that corporations can have their own Facebook Timelines. We initiated it Friday, and we think the timeline tells the story of QuiBids — which is integrally bound to the business and convenience of our customers — much better . We understand that we would be nowhere without you and we feel that this platform affords the opportunity for more personal interaction. We’re very excited about that! Many of you have told us that you don’t care for the upgrade, however. Because Facebook mandated that all brands convert to the new layout by April 1st, we figured we might as well try to make the transition as easy as possible for you all by highlighting a few of the more specific changes and explaining how to work with them. Maybe you could even help us tell our story better since, y’know, you‘re the story, after all. One of the more visible features of Facebook’s new timeline is the cover photo. This is the large photo laid out across the top of our Facebook Timeline, which happens to be a shot of our logo at the entrance to QuiBids’ Oklahoma City offices. We plan on utilizing this area to showcase lots of fun QuiBids photos in the future. Like this one. What would you like to see us post as our cover photo? Timeline’s new messaging feature will enable you to send us private messages, which opens up another, even easier customer support channel! In fact, we’ve already recruited the help of Sunny, one of our customer support representatives, to monitor the inbox and address your concerns. Would you like to have an issue solved via our Facebook page? Send us a message and we’ll help you out! If you have created interest lists before, you’ll then be given the option to add to a previously created list, or to simply create a new list. 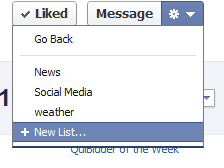 Above is an example of lists I currently use on my personal Facebook profile. As you can see, I’ve got my pages separated into News, Social Media, and Weather. Typically, I’ll add all of the news stations I follow to the “News” list, and meteorologists and weather pages are added to the weather list, etc. You get the picture. 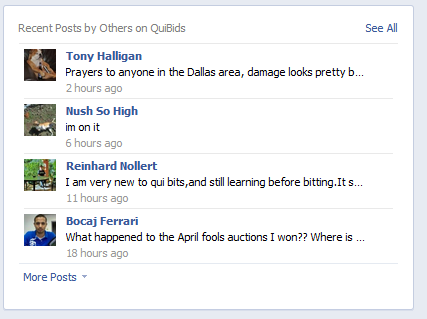 Make sure QuiBids is checked. At this point, you have the option of browsing through your pages, subscriptions, and friends (at the top right) and highlighting the other pages you’d like included in this list. You are not required to select other pages. When you’re ready to proceed, click Next. Next you will be asked to enter the list name. I already created “Shopping,” so I’ll choose that. 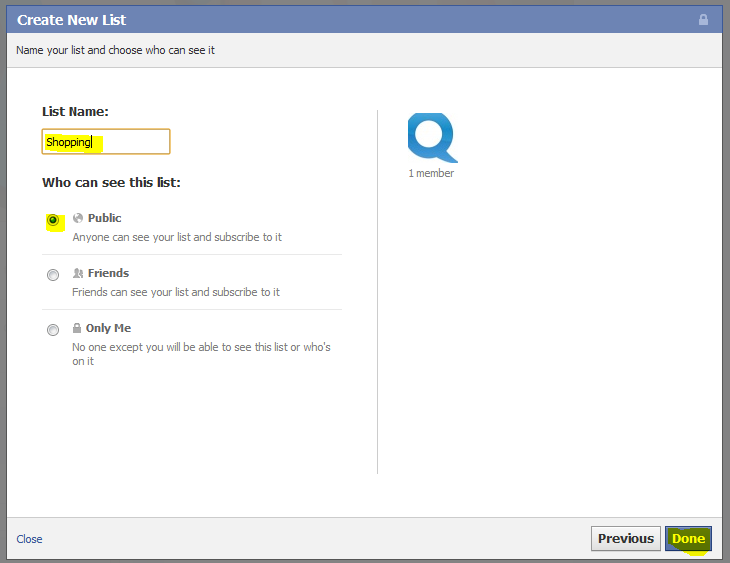 Once you enter the name, select the visibility of the list (visible to the public, visible to friends, only visible to you). After that, click Done to be taken to your new interest list feed. If you’d like to add other pages to this list, simply go to that pages timeline, and follow the above steps, but add the page to the list that was already created. Our Facebook applications used to be located on the left side of our page. But with the new Timeline, they now appear at the top, directly under the cover photo. As you can see, only four of the apps are visible, so you’ll have to click on the down arrow on the far right to see the rest of them. Once you click on the arrow, it’ll expand to show all other applications. Simply click “More Posts” to see additional posts from other users. Go to a specific point in history. You can quickly access a certain year or month from our page via the dates on the far right side of our timeline. Just click on a certain date to go back in time to that period in QuiBids history. Have you found these milestones? What other milestone do you think we should include on our timeline? If you have any ideas, suggestions, or questions about our new timeline, let us know in the comment section below.